Jo SiMalaya Alcampo is an interdisciplinary artist born in Manila the capital of the Philippines and raised in Malvern in the heart of Scarborough. They currently live Toronto on the traditonal territories of the Wyandot, the Petun, the Anishinabek Nation, and the Haudenosaunee ("People of the Longhouse"). Jo's art practice integrates storytelling, installation-based art, and electroacoustic soundscapes. Jo has developed community arts projects with queer youth, consumer/survivors of the mental health system, and migrant domestic workers. They are the playwright of the historical drama, Hilot Means Healer and is part of the artist duo, Kwentong Bayan Collective. Jo graduated from OCAD University with BFA Honours degree in Integrated Media and Photography. 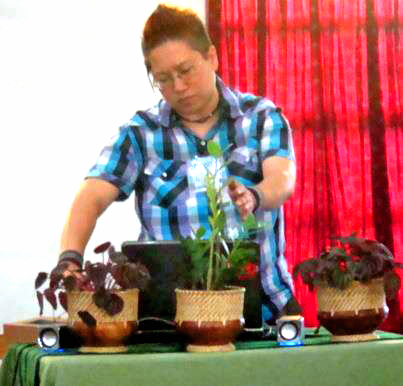 Advisors in OCADU's Indigenous Visual Culture Program inspired Jo to reconnect with their roots and travel, in 2009-2010, to Baguio, Bontoc, and Sagada in the Cordillera mountain region in the Philippines. Jo met with traditional teachers and indigenous rights organizations to learn how to develop an ethical code of conduct when integrating Indigenous Knowledge Systems and Practices within an art practice. One response to this ongoing inquiry is the installation: Singing Plants Reconstruct Memory. In 2012, Jo made a presentation at the KAPWA-3 Conference at the University of the Philippines-Baguio on “Indigenous Knowledge in the Academe - Bridging Local And Global Paradigms”. Jo made the journey with a group of Filipino-Canadian artists, critical thinkers and healers. They have since formed the Kapwa Collective and together they dream their visions for a Filipino-Canadian bridging narrative into action. Past projects include TBOLIxTO - a cultural exchange between the T'boli School of Living Traditions (Philippines) and the community in Toronto; and Restless Precinct - a site specific, group exhibition and performance series on land, identity and de/colonization in Scarborough's Guild Precinct. Jo has exhibited internationally at festivals, conferences and galleries including A Space Gallery, Antimatter Film Festival, Asinabka Film & Media Arts Festival, the Blackwood Gallery, CBC-Radio Canada International, Diasporic Intimacies Conference, FADO Performance Art Centre, Gallery 101, Gallery 44, Gladstone Hotel, the Independent Media Arts Alliance Conference, the Images Festival, the Inside Out LGBT Festival, InterAccess Electronic Media Arts Centre, Kapisanan Centre for Philippine Art & Culture, KAPWA-3 Conference, la Ferme du Buisson (Paris, France), Mayworks Festival of Working People and the Arts, Musagetes (Guelph), Nuit Blanche-Toronto, Myseum Intersections Festival, OCADU Open Space Gallery, Pride Toronto, Subtle Technologies, The 519, Vtape, Worker's Arts and Heritage Centre, Xpace, and Y+ Contemporary. Jo is a professional writer with work published in Akdaan Literary Anthology on the theme of Migrant Issues and Migration, Drawn to Change: Graphic Histories of Working-Class Struggle, TOK 6: Writing the New Toronto, INCITE! Journal of Experimental Media & Radical Aesthetics, Fireweed Women’s Literary & Cultural Journal, Pinoy Sa Canada, The Peak Magazine, Our Times Magazine, Briarpatch Magazine, and Ricepaper Magazine issue 19.4 on Asian and Asian Canadian activism.